The first half of this walk was glorious. The sun was out, the tide was in, and the waters gently lapped at the sand. Despite the weather the beaches were virtually deserted. The smell of the freshly applied sun cream to our faces made it feel almost as if we were on a beach holiday abroad. A pair of jet skiers zipped to and fro, taking care to avoid the solitary swimmer who decided to brave decapitation in addition to the cold sea. 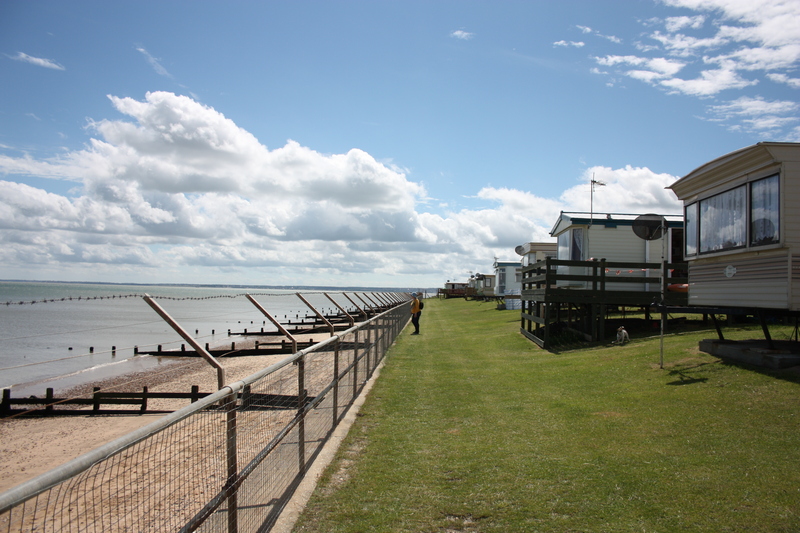 The walk along Warden Beach was less than a mile, and it ended at Leysdown-on-Sea, a town with more caravans and holiday homes than houses. The town is known chiefly as a holiday resort, although in the past it played an important part in the history of aviation. It was from Leysdown’s Aero Club that John Moore-Brabazon made the first British heavier-than-air powered flight in May 1909. South of Leysdown-on-Sea people once again became conspicuous by their absence, and aside from a few camper vans, we found ourselves alone. Just to the south of the town we saw Muswell Manor poking its head out of a cluster of mobile homes. This was once the first headquarters of the UK Aero Club, it was here that Brabazon flew his record-breaking flights. Muswell Manor was also the location of the world’s first aircraft factory, built by the Short Brothers on the adjoining land. The Manor is now a B&B, holiday park, and sales forecourt for mobile homes. 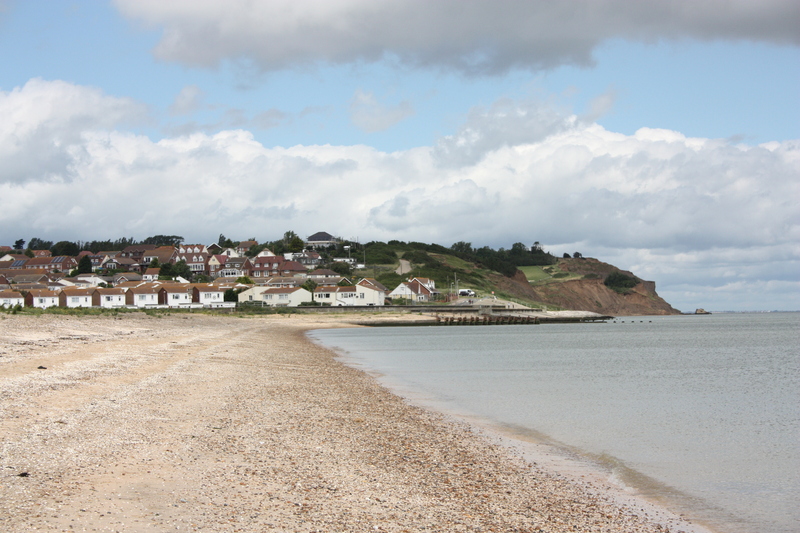 We continued south along the beach towards Shellness. Aside from a couple walking their dog we saw nobody. Until, that is, I saw a man with no clothes on nipping out from the bushes and then back in again. At first I did a double-take – the man was a good 300 feet away and I couldn’t be sure. But there he was again, stark naked and strutting back on to the beach. “There’s a naked man over there!” I hissed to the others. They ran up to see. Alas, even though we were a good distance away, the man turned and then realised we were in a little group looking right at him. 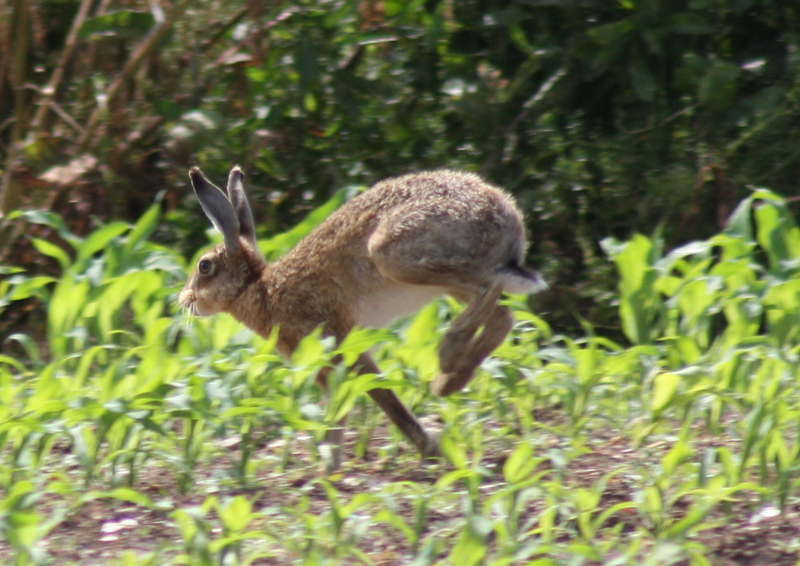 We hastily turned around and walked on. Of course! 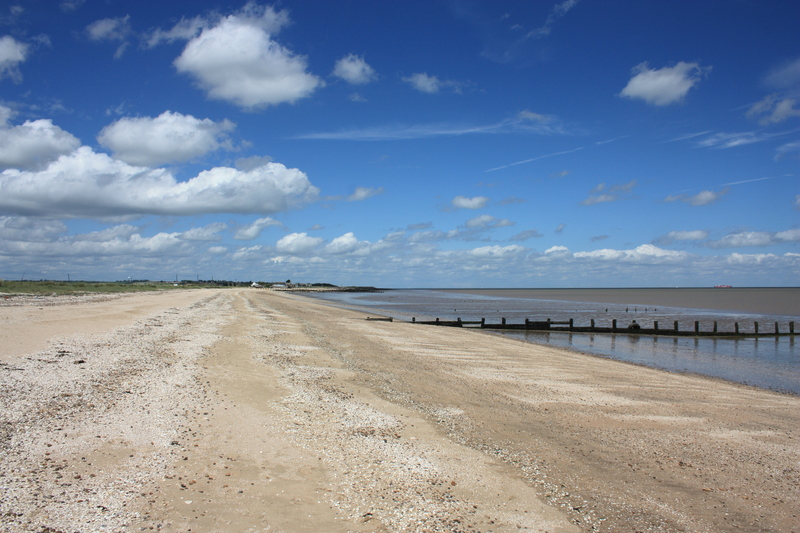 This was the Leysdown naturist beach. I had read that there was a nudist beach around here somewhere, but had forgotten all about it. I hope the man can forgive us our poor etiquette. He took us quite by surprise (and no doubt we him). As we approached Shellness the public footpath cut inland, heading west along an embankment separating marshland to the south from The Swale National Nature Reserve to the north. We said goodbye to the beach, and indeed to the sea, and headed back into estuary and marshland. After a taste of true coastal walking we were sorry to have to leave it behind. We will not meet the coast proper again for another five walks or so. The embankment took us inland for well over a mile, a tedious walk after the beaches we had come from. Eventually, however, we reached the tiny village of Sayes Court, where by chance we found the village fete in full swing. Sayes Court is on the Isle of Harty. Until comparatively recently Harty was a separate island. Indeed, to the west is another separate island within Sheppey, the Isle of Elmley. Before the rivers between these islands silted up, making Sheppey a whole, the Isle of Sheppey was known as the Isles of Sheppey. Given the tiny size of the village, the fete was impressive, and attended by many people. 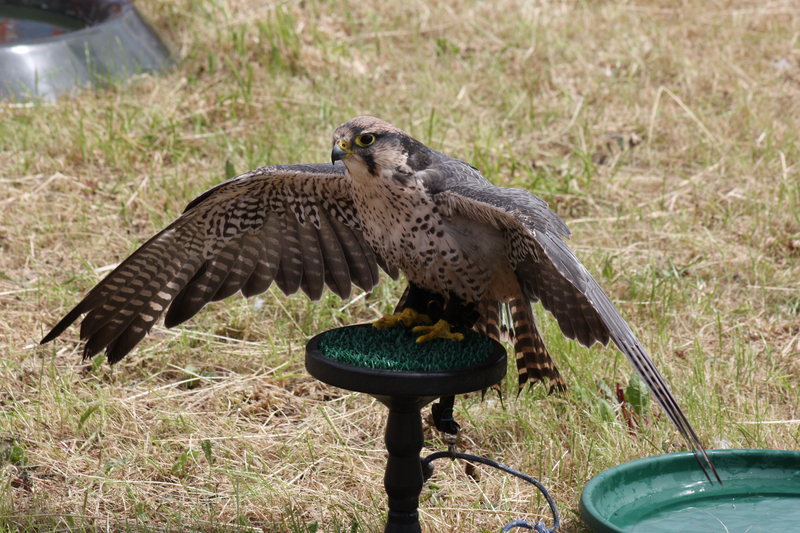 The star of the show for us was the bird of prey pen. This boasted a number of birds, including a golden eagle. 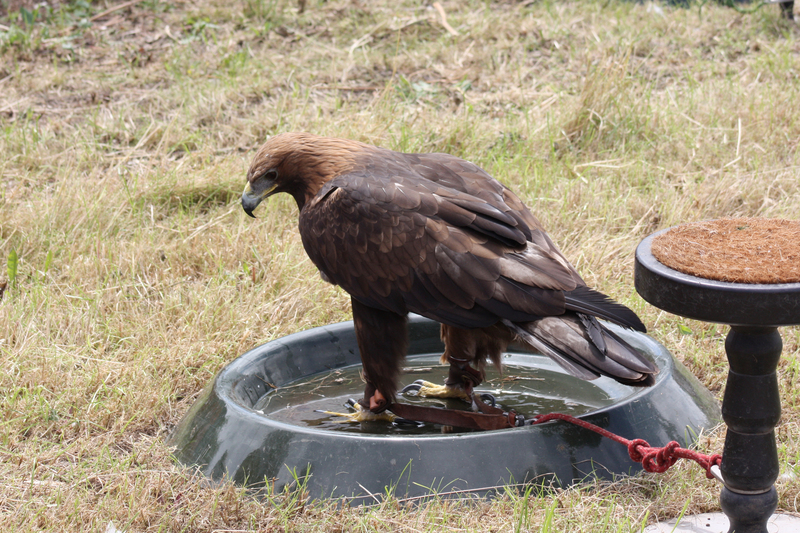 For £2.50 you could have your picture taken with one of them, excluding the golden eagle, the keeper said, because it might eat you! The kids got their pictures taken and we set off, heading southwest out of the village and towards The Ferry Inn. This lies on the southern-most point of the island, and was once the site of the only passenger ferry linking Sheppey to the mainland. If only that ferry still ran today, we could have jumped on board and crossed over to continue our walk on the other side. Alas, the ferry stopped in 1946. Heading north from the Ferry Inn, we soon reached Mocketts Farm, another tiny farm estate consisting of a few cottages. This was the point at which a perfectly pleasant walk turned sour. Although the Ordnance Survey map clearly showed a piblic footpath going through Mocketts, the gated entrance, whilst open, proclaimed it was private land. We continued undeterred, but soon found navigation difficult. There were no signposts whatsoever, and the right of way seemed to pass right through the middle of planted fields. We knew from the map that we were exactly where we should be, but we were reluctant to walk through these fields without being sure of our way. Where we thought the path should be seemed to go right through a field of rapeseed, too dense for us to cut our way through. For a full hour we consulted map, GPS and landscape. Eventually, everyone sat down while I went off to pathfind, but every potential route seemed to be barred. After getting home, Google Earth confirmed that we were in the right spot. It seems to me that Mocketts have decided to frustrate the walker into leaving their land alone. 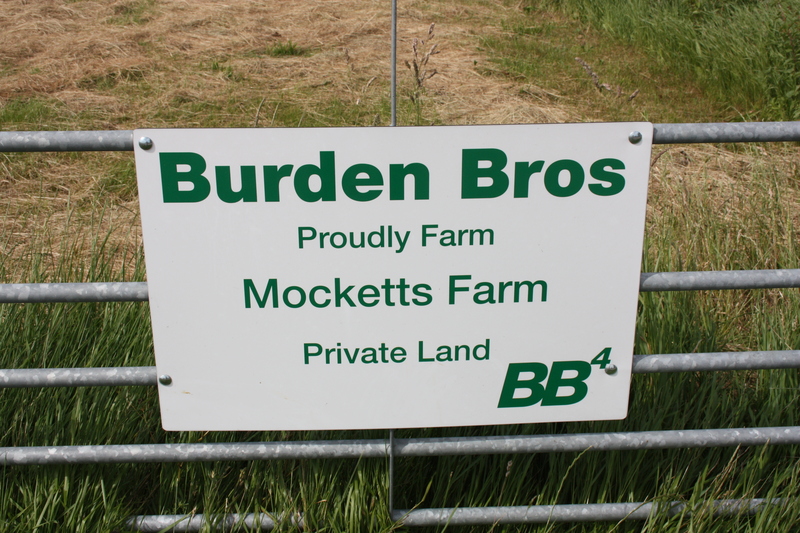 I may be wrong about this, but when we backtracked out of Mocketts and back to the road to make our way north, we came across another footpath sign pointing straight through another gate which had been padlocked, and upon which another Mocketts “Private” sign had been put up. By now running late, we started north on a tedious three mile road trek to Bay View, a small village to the west of Leysdown. The road was narrow , and with the volume of traffic by now leaving the fete, we had to constantly step in to the verge to allow it to pass. Being at one with nature was restricted to trying to identify roadkill in various states of manglement, and sometimes pressed into grisly road-art by the weight of hundreds of passing cars. 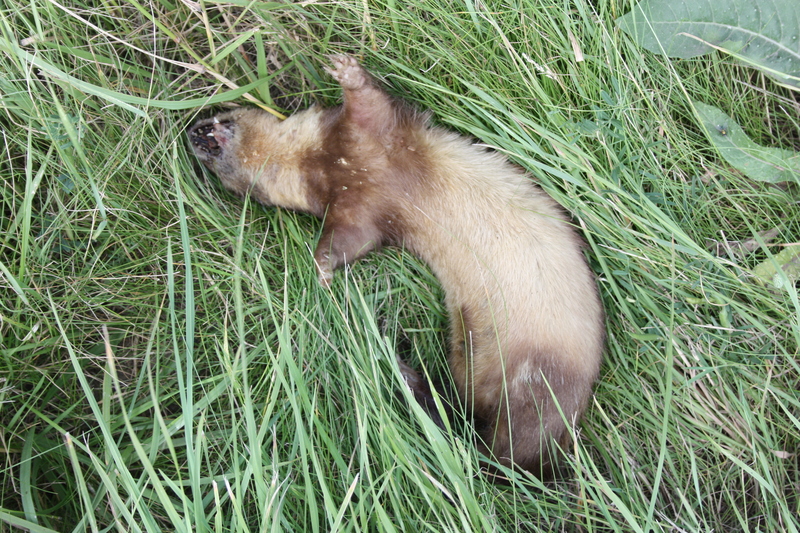 The flattened carcasses included a snake. 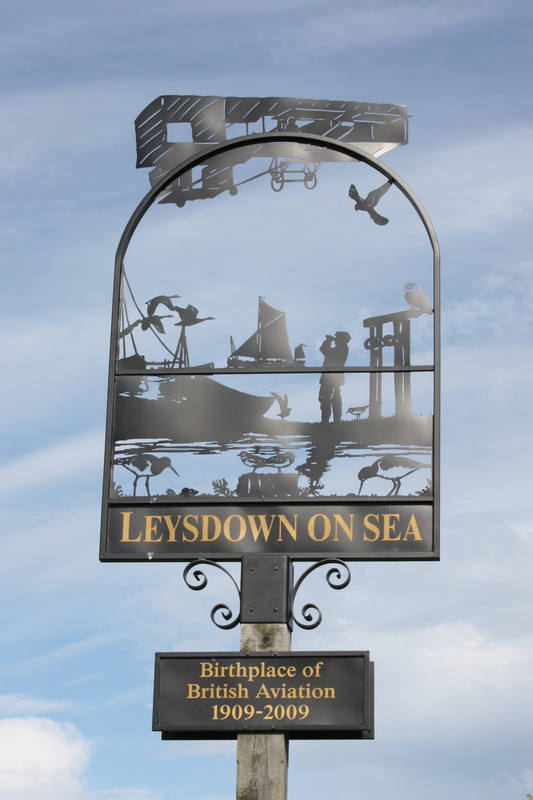 Eventually, we reached Bay View; a sign proclaimed that we were re-entering the conurbation of Leysdown-on-Sea. Our Ordnance Survey map indicated a pub on the main road, and we made our way to it, glad at the thought of being able to rest our feet and have some refreshment. We arrived to find the pub closed down – a final punishing blow! The others sat down on the front step and waited while I walked back to Warden and collected the car. This entry was posted in Islands, Kent and tagged coast, Isle of Harty, Isle of Sheppey, Kent, nudist beach, Shellness, travel, walking. Bookmark the permalink. GREAT POST! Would you mind if I reposted this on my travel advice site (http://CourtneyMara.com)? I would of course give you full credit and have it link back to your site. Did you report the blocked footpath to the council? I try to remember to do this, as a matter of principle. Thanks for the link Ruth – I see you’ve been hard at it recently and your pictures are amazing. Thanks for the link to the Ramblers’ Report – it makes for interesting reading. They report that “From the Ferry Inn westward the route is in some doubt. The bridleway nearest the coast at Mocketts has recently been diverted further inland. There are “Keep Out” notices around the bottom of Harty Hill…”. I’m sure it won’t be the first time we have this problem, and I know you’ve had your fair share too! The more you wander round Sheppey, even with pathfinding issues, the more I regret leaving out. Although I’m being inconsistent with islands; my ‘rule’ is much like Ruth’s above: I’ll do them if I want to. I’m also in a greement with Ruth re deliberately blocked paths. I’ve not encountered many but I’m all for reporting them; it’s the principle of the thing. Nic – agree was a lovely walk / scenery on Warden to Warden trek (in spite of enforced detour!). Sayes Court Village fete an unexpected treat. (PS: If I had known beforehand about Leysdown Beach – I would have bought along my binoculars!!!). Then what a Bucket List it will be!! !